I've just been adopted...I'm so happy - and I can't wait for my new family to see my fabulous dance moves! Hi! 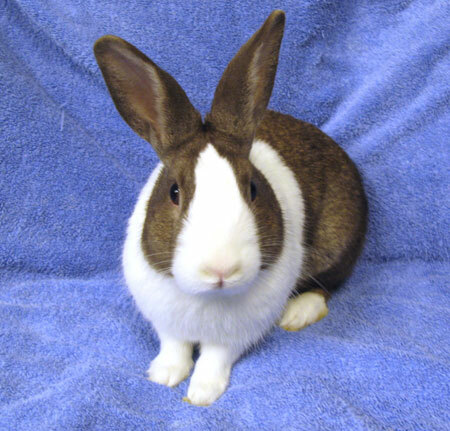 My name is Roger Bunny Pants and I am an active, outgoing and comical , neutered Dutch boy. I am a funny, quirky guy with a sense of humor and taste for adventure. I really enjoy "talking' with people and engaging them with my curiosity and rabbity antics. So busy, busy, busy! I'm also a nice guy who enjoys a good chat and some quality time with people. Overall, I'm a happy and well-adjusted boy. So, how did I end up here in rescue at SaveABunny? Well, it's sort of unusual for a Dutch bunny like me to have a malocclusion, but I did. I'm fine now though. My front tooth is crooked and so I might need occasional trims of my front tooth by a rabbit-savvy veterinarian. Anyway, I'm a really great guy with my little Dutch pants looking fur outfit and goofy ways. I hope you'll visit me very soon!